Now that we’ve had some time to really digest all that is the 2018 Chevrolet Traverse, we’ve returned with a follow-up to the “Five things we like” with five things we weren’t really digging about the new, full-size crossover. We’ve combed over our notes, spoke with the staff and came to five final conclusions about the 2018 Traverse, so without any further stalling, here we go. It seems like an interesting move, but Chevrolet will offer the 2018 Traverse RS will just the 2.0-liter LTG turbocharged four-cylinder engine. The LTG is not a terrible powerplant, but we hope it doesn’t feel lethargic lugging around the mass of the Traverse, especially in a sport-inspired variant. You read that correctly. For some reason, the bowtie brand is referring to the 2018 Traverse as a midsize crossover. We all know it’s a full-size CUV. In fact, it’s longer than a Chevrolet Tahoe. Midsize it is not. Upon receiving the first teaser image for the 2018 Chevrolet Traverse, we called it. The 2018 Traverse kind of looks like a larger 2018 Chevy Equinox. Hell, we even titled our original debut story in the same fashion. 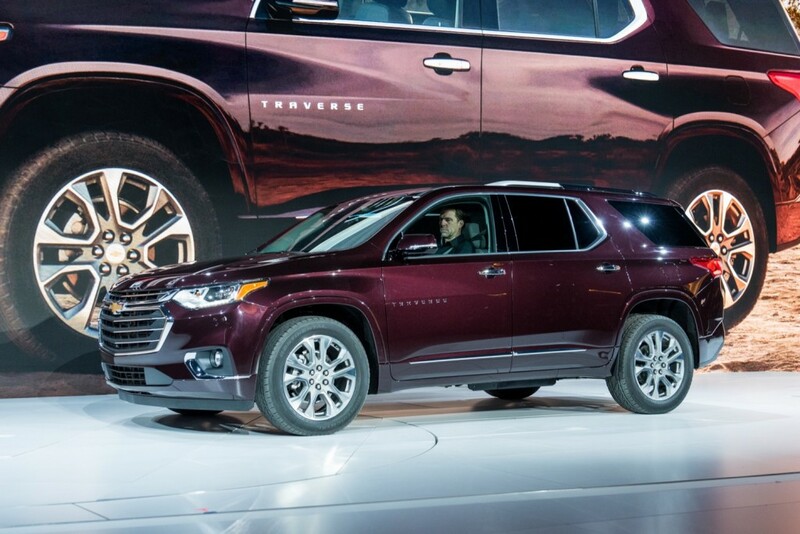 While we don’t think the Traverse is a bad looking crossover, after 10 years, we were hoping for something a little more progressive. We were secretly hoping Chevrolet’s new infatuation with diesel engines in its upcoming crossovers would lead to a Chevrolet Traverse diesel. However, it has not. At least not yet. Maybe Chevrolet has future plans, but right now, it’s a petrol-powered V6 or turbocharged four-cylinder providing power. This is not a complete knock on the Traverse, and we’re aware we can only expect so much from a Chevrolet crossover. However, some of the same hard, textured plastics remain as a material usage inside the 2018 Traverse. 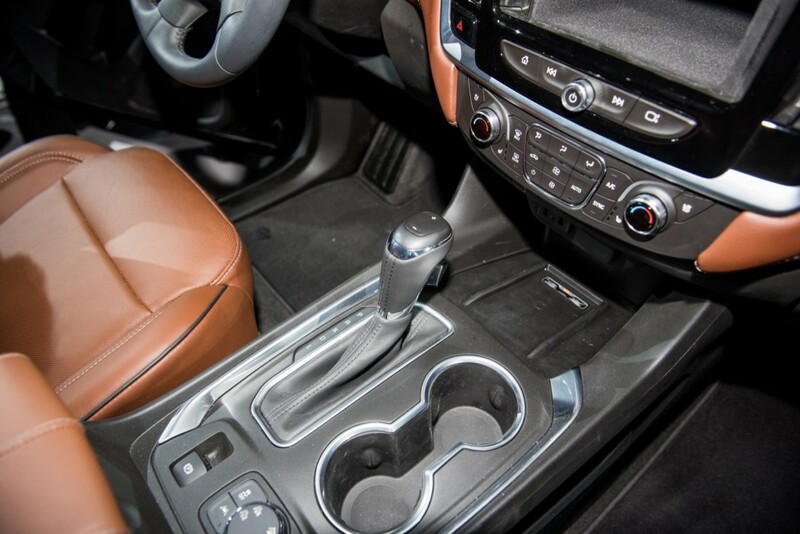 Otherwise, we think the interior is actually much improved from the outgoing Traverse. Interior has a strong Mercedes GLS influence, in my opinion, which is a good thing! Exterior styling, as seen from the Live Photos, is missing some of the spark that I first adored in the GM Media canned images. Still handsome but the vehicle stance is a little different. As strong or stronger as looks compare! but they mentioned that it is true that it incorporates plastic. Big deal in my opinion! the price is more than right! great interior. Panels decided why the body looks “Trucky” that is what Americans want. the Ford escapes “space age” look is just ugly. this is what crossovers should be! Excited to see what the actual specs are! With the increased torque of the turbo motor I don’t think I will “feel” slow. On the contrary, I think it will drive fairly sporty around town. They persist with that odd trapezoidal C pillar treatment across multiple crossover vehicle lines. Looked odd back on the Buick Rendezvous and still does. Still a vast improvement over the outgoing model. Next step for these new crossover/SUV’s will be to add high performance options for engine and suspension. Any idea whether it will be possible to deactivate the auto stop start even if it has to be done each time you start it? If you put the A/C on 60 the auto stop turns off. Turn the A/C up the auto stop starts working again. Nice evolutionary update and looks pretty classy. Kudos on the big weight reduction. However, the 2.0L Turbo should be used for an Eco model with FWD and CVT while the RS model should be AWD with a 3.0L TT rated at 380HP and a hotter SS model powered by a 3.6L TT rated at 430HP. Using these powerplants in the Traverse would amortize the development costs so that GMC and Buick could offer them in the Acadia, forthcoming Acadia XL, and Enclave. Now, to me, that makes more sense. Better yet, make the hotter SS version have a V8 engine like the Dodge Durango. Something like a 4.3L TT V8 with as much HP numbers as high as in the mid-400s would be awesome. Hell, why not throw in an off-road oriented trim with an air suspension or something like that like how the Jeep Grand Cherokee? The rumor mill suggests that GM will offer a Chevy Blazer CUV based on the current GMC Acadia / Caddy XT5 cross-overs that went on sale a few months ago. Can I ask why GM doesn’t simply offer a SWB version of this new Traverse and LWB version of the current Acadia. And Buick could also offer a SWB Enclave and a LWB Enclave. GM could always offer both the Chevy Blazer CUV as a sporty rival to the Ford Edge and Nissan Murano while the SWB Traverse and LWB Traverse square off against the Ford Explorer and Nissan Pathfinder. Same goes for a GMC Acadia XL, Caddy XT5-L, Buick Enclave SWB, and Buick Enclave LWB. Fill these segment niches / holes with these these SWB and LWB models and GM would get many more customers and sales! I love my 2011 Chevy Traverse. I was a little dismayed, but not at all surprised, that GM couldn’t come up with a better concept/improvement/upgrade for the Traverse. If they really wanted to do something performance-wise, the RS should have the Caddy ATS version of the 3.6, which puts out about 30-40 more horsepower. But the platform needs to be using AWD for any power upgrades. That’s just too much sexiness for the front wheels. It’s not really anything new. It’s almost indistinguishable from an Equinox, which is not a good thing. GM moves like pond scum when it comes to engineering, procurement, etc, so it’s no surprise that they always seem 2-3 years behind the game. Bring back brand autonomy so they can innovate BEYOND the scope of the dusty GM corporate stooges and stop manufacturing American products in foreign countries. I think most of the people here expect too much from Traverse, which was, is, and will be just a “relatively large family mover on a budget”. So, because it is “on a budget”, GM won’t put much Bells and Whistles in there, simply because there is Enclave above it in the product line – and maybe even higher, new XT7 or whatever will be. My version of why GM calls Traverse “mid-size”: they sell bus-like huge truck-based Suburban (pretty much “Tahoe LWB”), which is truly “full size SUV” by any means, so everything shorter/smaller than Suburban simply goes to “mid-size” in their own classification (which may not adhere to everybody else common sense). Was considering trading in my current Traverse in hopes of a 2018 4 cylinder diesel model. I think it would be a huge seller given the fact that so many of us use these oversized grocery getters to pull our RV’s and toys around. Don’t get me wrong, the current model does fine but something tells me that diesel might do a better job…May even up the MPG’s while not towing? Any news out there to date? GM? I absolutely agree on Number 1. Why the hell didn’t they give us the twin turbo v6 engine in the Cadillac CT6, or the V8 engine in the Corvette Stingray? Not to mention, why is it FWD only? If it’s a sporty model, IT SHOULD HAVE THE TWIN CLUTCH AWD FROM THE TOP END HIGH COUNTRY MODEL, NOT FWD! WTF!!? I really hope they overhaul the RS trim and put in, like I said, the twin turbo V6 from the Cadillac or the Corvette Stingray V8 engine, and make the twin clutch AWD standard. They should also add a sport mode, and a 6-speed manual as an available feature, actually, make that available on all trims. Oh, and the 2.0 turbo I4 should be the base engine if shoppers want better fuel economy. Any reason why the new LGX 3.6 is rated so low on both HP and torque in this heavy vehicle? They are only rating it for 305 HP and 260 torque which means 2014 levels of HP and 2008 levels of torque. Even the current and old LLT 3.6 makes 272 torque in the current 2017 Traverse. You need more torque to get these monster SUV’s moving not less. Note that this same engine is rated for 335 Hp and 285 torque in the Camaro and Cadillac lineup. Bought a 2018 Traverse and the Auto Start Stop is awful and cannot be disengaged. When cycling on and off there is a pretty loud electric click and the interior lights blink on and off. Also, the transmission feels like it has no idea what gear it should be in. Mine lurches from low speeds so badly that it makes my wife car sick on rides around town. So glad I leased, the next 34 months cannot go by fast enough. Looks like a Dodge Durango but with no V8 engine options. I’m a GM guy, but the Durango R/T is much better looking.